Mas Kagin Tapani: SOLOWARA 1 Project - A LONG TERM DISASTER FOR BISMARCK SEA COMMUNITY AND PNG. SOLOWARA 1 Project - A LONG TERM DISASTER FOR BISMARCK SEA COMMUNITY AND PNG. Professor in Environmental Science & Geology and Director PNG Centre for Climate & Sustainable Development. P.O. Box 320 UNIVERSITY 134, National Capital District, Papua New Guinea. The poor application of international laws (such the United Nations Law of the Sea, UNCLOS, International Maritime Organisation (IMO) Laws, Noumea Treaty, UNCED agreement ) and PNG’s laws and policies ( Mining Acts, Environmental Act etc) on the Deep Sea Mining ( Solowara 1) is a very serious challenge in managing and protecting the resources of the oceans and health of communities of the PNG. It is important to know that there is no Deep Sea Mining policy in the world in managing such resource for PNG government and its stakeholders must understand this status. In addition coupled with the relative short term ( 2-3 years) scientific and environment results, studies ( mainly desk top models) and reports carried in the Solowara 1 region ( EIS/EIA report) submitted to the PNG government for Phase 1 ( 30 Months Project) should be treated with caution and precautionary principles must be applied until full scientific proof is available. Application of adaptive technology in the tropical marine ecosystem has very serious limitation on PNG in deep sea mining must be evaluated and monitored for its mitigation purpose. Given the Sustainable Development ( economic, environment and livelihoods) scenarios and assessments of PNG and coupled with too questions and uncertainty on the Solowara 1 project, the PNG government and people must defer the implementation of this pilot project for the time being, if the Bougainville Copper Limited lesson is to be model for the Bismarck Seas and its provinces. Our review and analysis on other documents, our experiences and based on the above and the EIS for Phase 1 of Solowara 1 strongly believe that Solowara 1 pilot project will be a long Term Disaster for PNG and the health of its people. The history of the development of mining exploration and exploitation of the Mining and other non renewable sectors in the early 1960s followed by the signing and development of Bougainville Copper Limited- BCL( 1976) was a gigantic step for PNG government and people of Bougainville Province, is a great lesson for the Melanesian people to avoid through better governance and consultant process. PNG was then merely a speculator in the design and implementation of such project. The impact of such project was awesome in every way, it affected the minds of people and livelihoods, environment and economic and hidden surprises that our own people never envisaged until the best of our own traditional leadership brought the BCL into chaos and a massive disaster for our governance and the developer- The BCL hazards in terms of bloodshed is a great lesson for the PNG government and the Developer ( CRA limited). The international community and investors took great lessons in how to manage the resources and its strongest linkages to its people and especially for PNG and the Pacific countries. New technology and methodologies that were employed were recognized as the state art then as promised by the developer that it would have minimum adverse impact on the people/culture-Tradition, environment and economy of the country. Ok Tedi and Porgera Mines and others including LNG in the Southern Highlands are great evolving lessons and experiences for a young country that is still developing its human resources and especially skilled manpower to manage this sector for our local communities and country. Lessons like the compensation packages for environmental and livelihood impacts by Ok Tedi mine and the collapse of the new technology such as a Tailings Dam worth more than K1Billion to communities. In introduction of new technology in Porgera Mine for chemical waste removal such as cyanide and development of new tailings dam in Hidden valley mine are important examples of challenges in the mining sectors and the new legislations and policies must keep in pace. All these useful examples of governances in land mining sectors but we as country and the developer are still learning for these mining explorations in the tropical environment and most importantly the way our traditional culture and customs have influenced our laws and policies. Our governance in terms of politics, human capacity, economic, environment, livelihoods and Laws/policies were limitedthen . However, with massive land/mining resources in place with appropriate experiences, introduction of new technology, legislation and policies, will continue to develop as long as the implementation of the PNG Vision 2050 for Healthy and Smart PNGs is embraced we will achieve our objectives after 40 years. On Land is where non-renewable resource sector is characterized by mining, petroleum and Liquefied Natural Gas (LNG) resources. It remained the single most significant sector in terms of national income thus representing approximately 30 percent of the total annual national income between 1998- 2005. Currently, it represents over 80 percent of PNG’s total exports. Economic considerations concerning both income and expenditure by the national government have largely focused on the development and profitability of this sector, reflecting a government policy of GNP-led growth. In 2011, there are seven operating gold and copper mines (with 9 potentials ones) and 6 oil and gas (14 potentials) projects. The forecast is that the export of these extractive resources, the PNG economy is set to double its Gross Domestic Product (GDP) through the PNG LNG project. The K45 billion investments and potentially further LNG development from Gulf and Western provinces will certainly transform PNG’s economy, providing the country the foundation for long term investment in public infrastructure and services, needed for a diversified economy and an educated population, as long as the authorities markedly enhance the utilization of revenue. With the majority of the young and vibrant population of the country focused on rural renewable and non-renewable resources , planning and design of human resources and capacity building will be a significant challenge but a much needed priority area if such LNG resources is fully developed by 2014. In 2005, PNG real Gross Domestic Product( GDP) was about US$4 Billion from the agriculture, forestry and fishing sectors. As outlined in the PNG Vision 2050, our country that is also a newly emerging economy - with annual GDP grow that an extraordinary 9%, higher than that of China and other countries in the world. The main driver of this unprecedented growth is the mining sector, accounting for more 60% of the nation’s formal economy injecting more than PGK 45 Billions into our economy after the 2014 when the LNG project starts exporting. PNG’s mineral resources are so rich, and so sought-after by world markets, that sustained growth of the sector is propelling PNG to become a middle-income nation by 2050. The Solwara 1 project( see Figure 1) proposes to commercially exploit gold and copper deposits associated with deep-sea hydrothermal vents at a depth of 1,500 in the Bismarck Sea close to New Ireland and East New Britain Provinces, in Papua New Guinea. This pilot Project has be given the green light by the PNG Government to mine in the ocean for more than 20 years. It present the first large-scale, human ( mining) -induced, site-specific disturbance to the deep ocean basin anywhere in the world, it must be considered with exceptional deliberation and caution. Scientists only first discovered these deep-sea hydrothermal vents and their exotic ecosystems in 1976, and these biodiversity ecosystems in the oceans remain poorly understood today. So our Government wants to develop the first deep sea mining in the world in the country and especially in the Bismarck Sea with no experience, no offshore policy and no appropriate legislation(s) to protect its own oceans/waters and the health of its local communities? The Solowara 1 project was granted to the developer through the application of the Land-Mining Laws and policies for the Oceans/Seas mining areas? Please note that the ocean and Land cannot mix as these have different rates of changes and their boundaries of environmental conditions differ greatly. The ocean mining laws and policies must be different to land mining and also we must develop important human capacity resources in this area. Do you seriously believe that the Developer- Nautilus Company has any experiences in Deep Sea Mining in it’s country – Canada or elsewhere in the world?. Why has the company designed and developing a Two Phase Approach to develop this Solowara 1project.In the Phase 1 it is planned for 30months ( less than 3 years) with the accompanied EIS/EIA to the government at the cost of US$1 Billion. Within 3 years,Nautilus will be producing more than 2 million tonnes of ore each year and have yet to announce where it will process the ore and where the toxic waste will be treated and later dumped? Phase 2 will commence later after another EIS/EIA submission. This 2 phased design approach suggests the company is not fully confident in the venture. If the company has any experiences in deep ocean mining with international standards, countries like, Canada, Australia and New Zealand would have accepted their bid to mine in the deep sea environment before PNG and the Pacific ( Vanuatu, Solomon, Fiji and Tonga). In summary both PNG government and the Nautilus company seriously do not have the capacity and experiences to develop this initiative. However, the developer is using theSolowara 1 as Pilot projects will gain much need confidence and at the same time exploit other countries in the region and take advantage of the country’slack of appropriate laws and offshore policies? 1. Why should PNG government agree to mine in the Ocean floor at depth of more 1500meters if the land resources are abundant and plentiful for a 7 million people for more than 50years and beyond, with lack of capacity and expertise in this sectors?Can we defer the mining initiative by the Nautilus Company? 2. 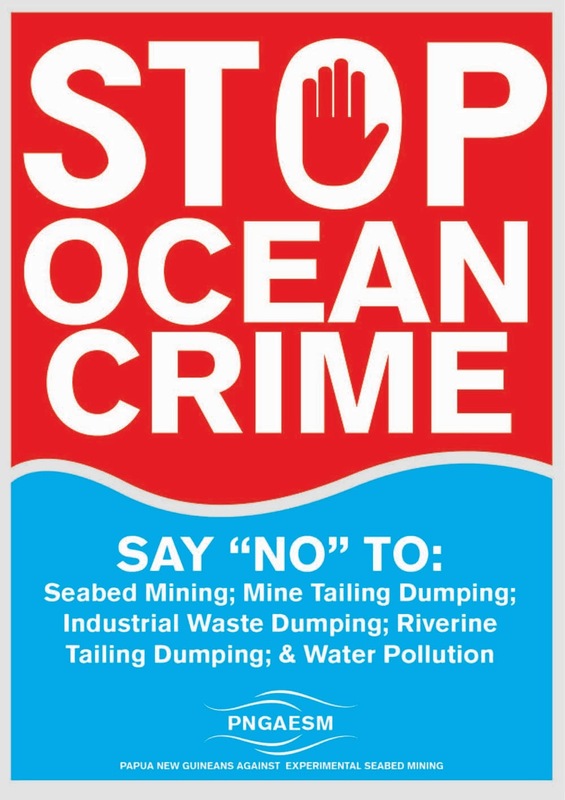 Can we tell the developer to go back into its back yard or other countries to trial this initiative worth US$1 Billion( EIS-Phase 1 for 30 months) if their ocean mining policies are in place?Yes youCan! Can we guarantee that the health of our people and oceans will be protected? No you cannot! 3. We do not have Mining and environmental Laws and offshore policies yet for Ocean resources and why should we entertain a developer if our house is not in order yet? The fact that PNG is the very first country in the world to grant tenements for commercial deep-sea mining operations, in water depths of around 1,500 meters is challenging and fully of unknowns. There are some marine mining for diamonds Namibia and South Africa, for gold off Alaska and for tin in South East Asia. However, these small operations are foundin shallow coastal waters, in the near-shore zone,closely to 1-200 meters depth at most. The move into truly deep-sea mining by PNG, places us at the global forefront of this new and challenging frontier and we must apply precautionary measures with full scientific understanding at all cost to manage the health of this country and its people and environment. The wealth of these resources will contribute significant promise for adding even further to our economic growth, assisting us to achieve the sustainable development measures as outlined in PNG Vision 2050.However, there are also many risks and uncertainties associated with this untested industry. Most important is the need to protect our precious marine ecology and living marine resources, from which our people have lived sustainably for thousands of years, and to ensure equitable sharing of benefits from offshore mining. We have challenges in developing our human capacity and technical expertise in this sector and more importantly our educational sector cannot meet the demands and expectation in such new developments and associated with advanced technologies. In addition, ours policies and laws must be updated and with such new initiatives we must have a world-class policy and legislative framework, to guide development of this emerging industry, in an orderly, sustainable and environmentally and socially responsible manner. We must have either ocean and or offshore policy urgently to protect the health of our people and oceans resources is a priority. PNG LAWS and POLICY Applications. The non-renewable resource sector is housed on land and has significant implications for land-use. It is characterized by mining, petroleum and gas resources. It remains the single most significant sector in terms of national income thus representing approximately 30 percent of the total annual national income between 1998 and 2004. Currently, it represents over 60 percent of PNG’s total exports. Economic considerations concerning both income and expenditure by the national government have largely focused on the development and profitability of this sector, reflecting a government policy of GNP-led growth. The PNG government has ratified a number of important international laws and acts,include the United Nation Law of the Sea (UNCLOS), International Maritime Organization, Noumea Treaty, UN Biodiversity Convention, UN Framework Convention on Climate Changeand Torres Strait Treaty are considered as the important ones linked to the Oceans resources and mining in our seas that could support our national laws and offshore policies. For example, the urgent need to implement the UNCLOS and completion of the PNG Exclusive Economic Zone ( EEZ) and in order to ensure PNG’s ability to exercise its full sovereign rights over its seas, seabed and subsoil thereof, as entitled under LOSC, including in relation to offshore mining, the Government of PNG will, as a matter of urgent priority. i) Mining Act 1991… Sections 17,19, 41 ( 1) and Section 152removes any responsibility or obligation on the lease holder for the removal of a mining plant, or, tailings, etc., on the expiry of tenement which is subject of a mining development contract. It becomes the responsibility of the State. Here the obligation is placed on the State to ensure safe removal of any untreated and hazardous materials or substances on the land. ii) Both the Mining Act 1992 and the Mining (Safety) Act 1977 are inadequate in relation to the containment of mine tailings and responsibilities that a mining lease holder must be compel to fulfill prior to the grant of a mining lease and upon expiry or abandonment of the mining lease for whatever reason. This legislation was enacted in 2005 for purposes of establishing the Mineral Resources Authority (‘the Authority”), a body corporate with perpetual succession and to give it powers to acquire, hold and dispose of property and is a legal entity. The Authority is an organ and instrument of the State and is entitled to the benefit of any immunity or privilege enjoyed by the State. Again this Act does not have any specific provisions relating to the requirements of maintaining operations that are of best international standards in dealing with mine activities, tailings or hazardous waste and has not vested any powers on the Board to determine any issues of compliance or impose penalties for non-compliance. History has pointed out that clearly neither the Mining Act 1992, the Mining (Bougainville Copper Agreement) Act 1967 or the Mining (Ok Tedi Agreement) Act 1976 with its Supplemental Agreements do provide in detail any requirement on the method and type of technology or specification on mine tailings/waste. The Acts were too vague as to the engineering design and construction specifications, the Act focused on minimising environmental pollution but fell short of providing for the actual details of the engineering concept and construction design or the method of containment such as dry stacking, backfilling or in-pit disposal. The Environment Act was enacted in 2000 and it is a very useful and modernized legalization for the country. It repealed and replaced the Environment Planning Act, the Environmental Contaminants Act and the Water Resources Act. This Act is meant to be a one-stop-shop for all matters dealing with environmental planning and management in PNG. The legislative scheme of the Act is designed to promote the development of natural resources but within approved environmental parameters as outlined in the legislation. The Act was meant to manage development in an environmentally friendly manner as stipulated under Sections 51, 52 and 53. These provisions provided for the procedure for designing an Environmental Impact Assessment (EIA) processes and the procedure for submission and approval. This process requires the companies engaged in mining developments inform the government of their plans and manner in which they will carry out the mine activities and especially tailings disposals in the deep ocean and dispersed through large volume of sea water. Since the enactment of this legislation all current mining operations now are required to comply with the provisions of the Environment Act 2000 in terms of mine tailings, new technology and can be applied to possible offshore mining policy if we develop one urgently? The Water Quality Regulations set out the minimum standards of water quality that is safe for human consumption and the protection of the ecosystem. The water quality standards adopted by the Regulations are based on the World Health Organisation’s water quality standards acceptable at the relevant period. It is noted that water quality is subject to weather patterns and other natural and man-made occurrences. The criterion used for the standard of water quality is flexible to allow for a revision of the standard based on new scientific evidence. Thus it is important to have a system of water quality standard that is flexible to cater for any new standard to be applied subject to new internationally accepted standards applicable to oceans and sea environment. Whilst there are guidelines developed in the Pacific region to support development of policies and laws on Deep Sea Mining ( DSM), there are no DSM policy in the world. Currently is no Offshore Mining Policy to assist the PNG manage the deep sea mining activities and protect the health of the ocean resources and its people. The need to develop the offshore mining policy is important for consultation amongst communities and the developer is imperative. Note the provisions of the Organic Law on Provincial and Local-level Governments relate to the ability to make laws, including in relation to the natural resources and mining on land and oceans.The policy must include the Provincial/LLG governments as the main stakeholders to benefit. Figure 2: Shows the Provincial and EEZ boundaries. vii) National Maritime Pollution Laws? PNG is not a party to the International convention on civil liabilities for oil pollution which posing as well high risk in maritime activities like the Solowara 1 activities. The two Bills ( Sea Dumping and Shipping) on Marine Pollution for PNG government is still outstanding which is important when it is approved by the government. This two bills submitted by the National Maritime Safety Authority (NMSA) is critical in monitoring shipping movements and oil spills in the area and Bismarck Sea and compensation claims by stakeholders. c) Canada and Nautilus Company. The Nautilus is a Canadian company and it has registered offices in England, USA, Australia, Tonga and Papua New Guinea. The Government of Canada laws( Environmental Protection Agency-EPA) does not allow private sectors and developers to invest into mining ores in the deep sea/oceans in its country. This is the first time Nautilus company is rushing this venture into deep sea mining in PNG to gain huge experiences and confidence at the expense of PNG government andits people lack of knowledge and capacity. The developer has contracted partners to build the technology and ships for this initiate. The bottom line is the company does not have experience in the deep sea mining in the world and implying that its technology need to be tested ifit is appropriate in the tropical ocean environment such as the Bismarck sea. The developer fully understand that PNG Government does not have modern and appropriate laws and policies and in addition the country lacks technical capacity and poor governance especially in politics. 3. Naulitus Design- Phase 1 and Phase 2. We know that the Developer- Nautilus Company has no or limited experience in Deep Sea Mining in its country – Canada or elsewhere in the world?. Why has the company designed and developed a Two Phase Approach to develop this Solowara 1 project? What are risks involved and considered here for this decision? The decision could be financial coupled with uncertainty or precautionary principles in their design. The company has submitted this 2 phases approach to the PNG government and we have accepted it hence, it had to complete its Environmental Impact Statement ( EIS) for Phase I first for the government to approve and start the mining in the deep sea in between New Ireland and East New Britain Provinces. Phase 1. The Phase 1 is planned for 30 months( less than 3 years) or more with the accompanied EIS/EIA report to the government at an approximate cost of US$1 Billion. This will mean that the mining operations may commence in 2013. This is highly technical project and PNG communities will not be active participants as the processing of the Ore ( concentrate) will be shipped overseas for processing. The main question is what if the Phase 1 proves unproductive financially for the company and leaves tomorrow? Do we havea comprehensive hazard and risk management place for the PNG government to address environmental and social hazards in the Bismarck sea?. Phase 2 will commence later after another EIS/EIA submission and approval by the government. Our experiences on the strategy for the two phases design approach suggests the company is not fully confident in this project. If the company was confident in its design it should develop the project for the 20 years.To reaffirm our point if the company has any experiences in deep ocean mining with international standards; countries like, Canada, Australia and New Zealand would have accepted their bid to mine in the deep sea environment before PNG and the Pacific ( Vanuatu, Solomon, Fiji and Tonga). In summary both PNG government and the Nautilus company do not have the capacity and experiences to develop this initiative and are using the Solowara 1 as Pilot projects to gain much needed confidence in this industry to later expand its activities on other countries and region..
4. Environmental Impact Statement ( EIS/EIA) for Phase 1. It is understandable that some useful background research to identify minerals in the Manus basin in the Bismarck sea was conducted to support this pilot design project in the area of Solowara 1. However, the research and studies carried on the designated site were conducted in a limited time period( from 6month to 1-3 years) to tests the methodologies and technologies. In addition numerous desk top studies and models were developed as well to understand the real situation on sites. Hence the EIS reports does not provide enough understanding on the merit of this Phase 1 to be awarded to the company. i) The technology used and applied are indeed new for such application and these have never been trailed in such conditions especially the oceans/seas. Using oil and gas technologies and applying these in the tropical ocean environment is questionable and must be monitored very careful on its application and suitability. ii) No mitigation strategies were discussed in terms recovery and lost of the tools and technology in the oceans. i) Poor understanding of water column biodiversity from the surface to the bottom and outside the designate area. ii) Insufficient data collected in the area to support the modeling of the water quality and its understanding of social and health impacts. iii) The application of the model is questionable in this area and new methodology will need to addressed. iv) Inadequate assessment of risks associated with sediment and waste rock disposal, toxicity of the dewatering plume to deep-sea organisms, effects of increased light and noise in the deep ocean environment, and potential accidents on seafloor equipment or surface vessels. i) This is a new technology for cutting and crushing rock material into small, sandy, gravel and silt collected and pumped into the ship above the site. We will have no idea with size of rock materials being dispersed and left at the bottom of ocean. ii) The monitoring and evaluation of such tools operation and its impact is not included. i) Some of the monitoring and studies on the site for oceanography but needs a long time period to understand the currents, temperature, salinity etc and especially how the sediment load and waste is transferred in the ocean and will end up on the coastal areas and reef systems. ii) Understanding of the storm surges, currents and up-welling events, El nino, pressure and other climate drivers in the Bismarck is critical for mitigating any potential disaster when shipping the ores between the oceans and Rabaul ports. iii) A 24/7 weather monitoring and early warning station and strategy should be developed for the site and the surrounding communities and shipping groups. iv) Results of oceanography and physio-chemical research for the last 5 years in the area and Bismarck and Solomon seas indicate the currents are indeed very fast as compared to EIS results. i) The mining activities will produce approximately 2 millions tonnes( 8um size) of ore each year for the 3 years and the company has not identified where it will refine the ore.
ii) Most importantly, the toxic waste must be treated before it is returned into the ocean? Where is the treatment of the toxic waste performed? iii) The large volume of fine Sediment and watered waste approximate 8um size will be deposited back into the bottom of the sea after the ore has been processed . The impacts of these very fine sediments and dissolved chemicals will impact the biodiversity and organism and the sediments can travel through the Bismarck seas , breeding grounds of fisheries, reefs and finally end up on beaches and coast areas of New Ireland, New Britain and Bismarck sea Provinces. v) Waste spillage and drifting ashore spilling its toxic cargo and fuel onto the coastal reef system and potential for the whole Bismarck seas/provinces. i) The short term work and research conducted in the PNG waters and Bismarck Seas and with this work reveal that most species discovered at vents are new to science, and in our biodiversity and fisheries sectors deep-sea habitats. ii) Extensive patch of productive vent habitat, including tens of thousands of vent chimneys, killing virtually all of the attached organisms will be destroyed.Mining is expected to alter venting frequency and characteristics on surrounding seafloor areas as well, thus affecting the biodiversity of a much broader scale than just the mined site. iv) Biological and statistical assessment on the data and area is incomplete. v) A number of hotspot biodiversity for the world designated in the areas next to the site is not assessed for community long term benefit. vi) It is likely that the project would result in severe, prolonged, and perhaps region-wide impacts to a globally rare and poorly understood biological community, and it is clear that the EIS does not adequately assess many of these impacts. Further, the benefits to local people or the economy of PNG seem disproportionately low compared to the scale and risk of the project. g) Research Period on the site. i) The research understanding of the solowara 1 site and time frame is too short ( 1-3 years) to assess the viability of such project on the site . ii) Not much studies were conducted around the site to better understand the comprehensive risk to the project and the marine resources such as fisheries, reefs, and coastal communities. While Nautilus conducted some extensive studies of the deep-sea benthic (bottom dwelling) communities at the site, no systematic study was conducted on the deep-sea pelagic (water column) community that would be impacted immediately overlying the seafloor. iii) The need for long term research and monitoring must be developed to support PNG policy development and provide useful information in confidence on the new technology and tools used on and around the site. The Solwara 1 EIS makes an initial contribution to deep-sea science understanding, it is clear that the EIS does not present sufficient information to which the PNG government can effectively judge the project’s expected impacts. Thus the EIS is judged as not fit-to-purpose. Many risk contingencies are poorly analyzed, some are not analyzed at all, and many of the baseline studies necessary to understand potential impacts have yet to be completed. In addition it will be important to receive the Nautilus Company Environment Management Plan (EMP)urgently for review and evaluation. The EMP must contain important mitigation strategies, especially developing comprehensive hazard and risk management in the issues and concerns outlined such as developing strategies for sediment waste and tailing disposals, accidental spills on ships, social conflicts between communities and Nautilus workers. It is imperative that the National government and the provincial governments gets its house in order first by developing its deep sea mining laws and its offshore policy before exploiting its natural resources in a sustainable approach in the oceans. The application of precautionary approach be applied to such project. 1. The Phase 1 EIS (EIA) is flawed and more research and development on the technology and methodologies be explored to improve the understanding of the deep sea mining and oceans resources. 3. While the Project could provide a gross almost $1 billion USD in its 30-month lifetime, it expects to provide only $41 million in total taxes and royalties to the government, a $1.5 million development fund, and a few dozen jobs at most to PNG nationals. The national impact is thus negligible( as compared to the mining venture on land). 6. Set up a multi disciplinary committee to review the Solowara 1 project and make a recommendations to the government for a decision.